This is a case of magic epicanthoplasty. 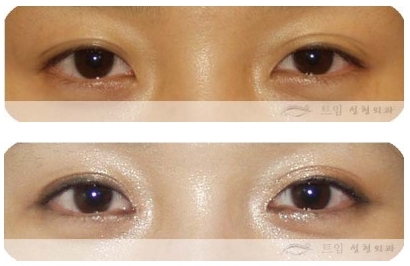 In this case, Dr kwon focused on changes in the direction of inner corner eyeline and form of epicanthic eyes rather than the size of the eyes. By releasing the tension of Mongolian fold, her inner corners of the eyes now have smoother and gentler curves. You can also see the bottom eye lines are also more horizontal. Overall, the eyes are more vivid and soft than before the surgery. The slope the heads of the eyes usually look more tilted by the tension of Mongolian fold so Magic epicanthoplasty can help you obtain half-moon eyes with gentle eye lines.